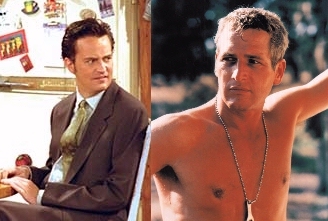 The ultimate Paul Newman tribute came from an episode of Friends in May of 2001. Flinchy Chandler runs away on the day he's supposed to marry Monica. He explains his fears by arguing that it's always impossible to make a marriage work. "The only person who can make marriage work is Paul Newman. And I've met me. I'm no Paul Newman. I don't race cars. I don't make popcorn. None of my proceeds go to charity."